The official website updated this morning to announce that Sengoku Basara 4 Sumeragi will be available for preorder on PSN starting from today. A DLC bundle: Full set of 11 types of weapons with inscriptions (small). This includes the inscription packs Attack, Maximum Style & Basara, Defense, Healing, Coins, Experience, Hit Count, Whetstone & Tamahagane Steel, A Card Played, Extreme, and Change. Ashikaga Yoshiteru's Rinne Genkou DLC weapon (the same one you will receive if you purchased the first press of the physical edition). Yoshiteru's weapon will be available for all orders up until 31st August 2015, but the inscription bundle is only for people who preorder through PSN before 19th July 2015. The game will start downloading on 21st July 2015 and unlock ready for play on release day (23rd July 2015). To claim the bundle of weapons with inscriptions, you have to go to the Basara-ya shop in-game where they'll be available for free one-time-only purchase. From the picture it looks as though each inscription pack contains a weapon with six pre-determined inscription sets, for example, the 'A Card Played' pack has six of that inscription on one weapon, while the Attack pack has six inscriptions chosen to boost attack damage. Please note that the four exclusive 'early reservation' DLC weapons are not included for PSN customers. A set of Capcom x B-Side Label collaboration stickers have gone up for order on the e-Capcom website, due for release on 24th September 2015. They're billed as being suitable for use on a bike or car since they're waterproof and UV coated to resist damage from the sun. 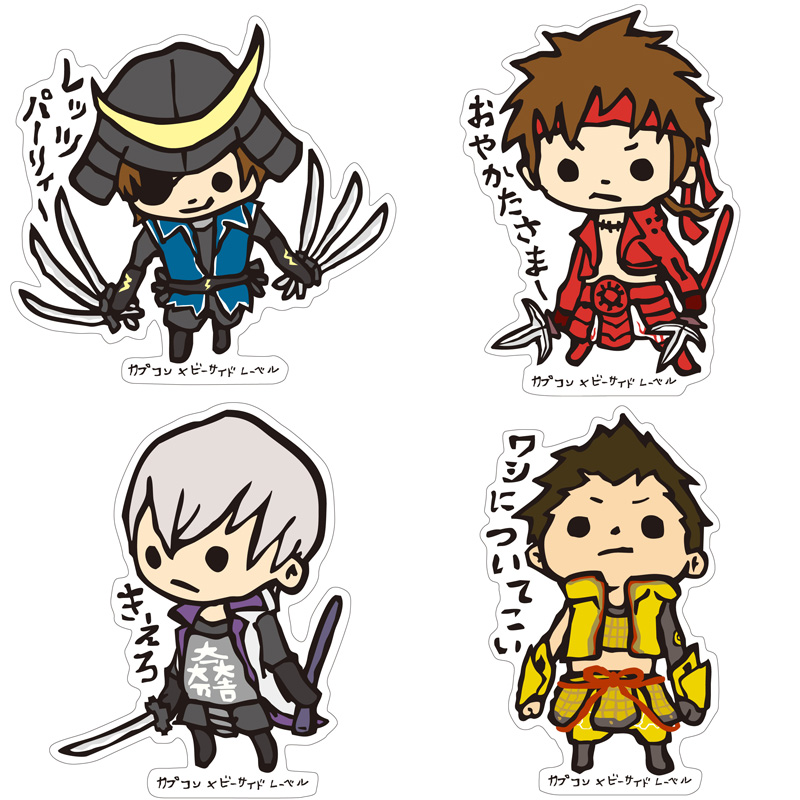 The ¥400 stickers are available in four different designs: Masamune, Yukimura, Mitsunari and Ieyasu. There's also a set of four with all of the different stickers for ¥1,600. I guess my patience would have paid off, but I caved in for the special edition physical copy already. I'll actually miss the launch date due to vacation anyway, and my PS3 hard drive is really running out of space. Not to mention I don't know the status of the special DLC costumes, and those are more enticing than basic inscription weapons. If I read that correctly, Ashikaga's weapon is free for everyone until August 31? And that's only for digital orders? Shame if it is. Ashikaga's clockwork weapon is a 'limited quantity bonus' for both the physical and digital editions. For the physical ones that just means the first print run but I guess they had to give it an actual deadline for digital customers to make it less confusing to work out whether it was included. I hope you'll have a good vacation! It would be nice if they'd confirm the DLC costume pricing and availability (I'm guessing it will be up on launch day but it's still unknown) so we can work out how pricey the special edition mini-artbook actually is. I am going to eat my Nobunaga Oda towel in order to get my 120 dollar's worth out of my physical preorder.